Occasionally a game surprises you. 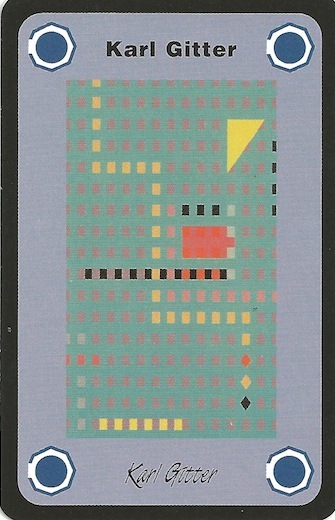 The game that has done this to me most recently is Modern Art (sorry, no Amazon link - I think this version might be out of print). Modern Art is an auction game where you are trying to make money by buying and selling pieces of modern art. To start the game, you will have a hand full of modern art pieces by different artists. On each of your turns, you will select one of these pieces to be auctioned off. Depending on the card, there are different kinds of auctions. When auctioning a piece from your hand, you are welcome to participate, but if you buy your own piece, then you pay the money to the bank - if someone else buys your piece, they pay you. However, at some point the market will become saturated. Once a fifth piece by the same artist is played, the round immediately ends. Then, based on the number of pieces sold by each artist, you determine how much each of these pieces is worth (you want your artist to have sold the most pieces). Plus, each artist's value is cumulative from one round to another, as long as they are in the top three (of five) artists. At the end of each round, you must sell all of the pieces you have bought. Next, each person gets new cards and a new round is started. You play through five rounds, and whoever has the most money at the end is the winner. "Karl Gitter - his stuff is hot this year!" The first pro that I have for Modern Art is that it is fun. This is the part that surprised me. I picked up a copy of the game because I saw it cheap at a convention, and I knew it was ranked well on Board Game Geek. However, reading through the rules, I thought, "ok, well, it seems like the game will work," but I missed where it would be very enjoyable. Once we started playing it, and we were trying to convince each other of the value of the paintings we were selling ("Karl Gitter is hot this year - you definitely want this..."), I found where the enjoyment was hiding. We had a blast playing the game. Since most of the auctioning is done aloud, whoever is selling the piece will regularly be doing his best salesman pitch to try to convince the other players why they should pay tons of money for the piece - after all, you keep the money from the pieces you sell. Which leads to my second pro - I like that you keep the money from the pieces that you sell to other players. It is definitely important to make money by selling pieces of art at the end of the round. However, you can make significantly more money by selling works to the other players. After all, if a piece is going to be worth at least $90,000, why shouldn't they buy it from you for $80,000? They'll make $10,000 that they couldn't make otherwise! (Of course, you will be making $80,000!!!) This mechanic forces you to drive up the prices as much as you can while selling - but, if you drive them up a bit too high, you might wind up buying the piece from yourself and having to pay the bank. Suddenly, you are only making the $10,000 instead of the $80,000. The fact that you are making the money from the other players, I think, also leads to one of the main strategies of the game - you have to determine which artist you can make incredibly valuable at the end of the game. Since you are dealt a lot of extra art in the first round, you can do some planning about which pieces to sell now to build up value for an artist, so that you can sell more of them (for a lot more money!) at the end of the game. Third, I like that there are different kinds of auctions. Specifically, there are open auctions (everyone yells out prices), silent auctions (everyone shows their bid at the same time), fixed price (the seller says what it will cost, and each person has the option to buy it or pass until it is sold - with the seller being forced to buy it if nobody else does), once around auctions (each person gets one chance to make a bid), and double auctions (it gets sold with another piece by the same artist). This keeps the game from feeling monotonous. Honestly, the game would be essentially the same if it was played entirely with open auctions. But, though it would have the same strategies and such, it would be much more dull, as you would be doing the same thing over and over. With the different auction formats, the game stays fresh (and you have to figure out what your salesman speech should be with each of the different auction formats to make sure that you milk your opponents for as much as you can). 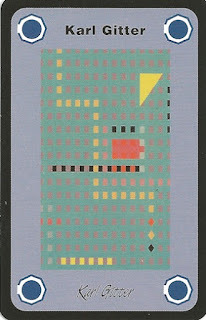 "Yoko has been doing really well"
Now, with all that I love about Modern Art, there are a couple of minor cons. First, there is (in my opinion - and I get to write the blog, so I get to share my opinion) a definite ideal number of players. The game can be played with 3-5 players, but I really think that it works better with more players (so, 5 is ideal). After all, since the entire game is built around auctioning things off amongst yourselves, if you are able to sell your art in a bidding war between 4 people, it will be much more exciting than a bidding war between 2. 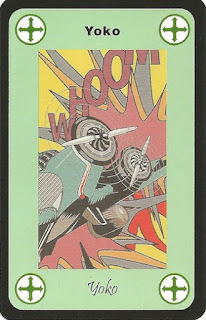 Next, the double auction card is incredibly powerful, and so there is a bit of luck involved in what you draw in the game. Since the double auction lets you sell of two pieces at the same time, you are increasing the likelihood of that artist being one of the artists that is worth money at the end of the round (and also increasing the chances that their work is worth more money at the end of the round). You are also, simply, selling off twice as many works of art, so it should (theoretically) be worth twice as much! Now, I still think that strategy is heavily involved, even with these cards (do you want to use them early on in the game, or save them until the last round and hope that the artist has been valuable to that point), but the double auctions definitely seem outright better than the other auctions (of course if you only get double auctions, then you won't have the second work that you need, and so you'll have to share money with someone else who can provide that piece). Overall, I give Modern Art a 9.0/10. I love the game - I was very pleasantly surprised with it. I think that it is one of the more fun games that I have played in recent memory! If you like financial games, you might also want to check out Power Grid, Acquire, and Chicago Express. 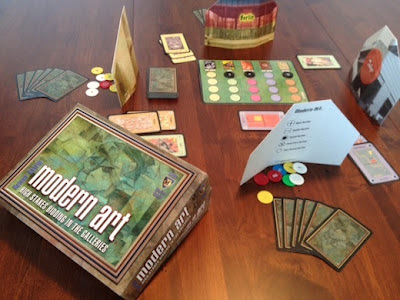 Or, for a second opinion on this game, check out this review of Modern Art at Play Board Games. Agreed on all counts! A wonderful game, especially with 5 players. Last point - don't confuse this with Modern Art: The Card Game. That one is a much simpler set collection game and is just not worth your time.